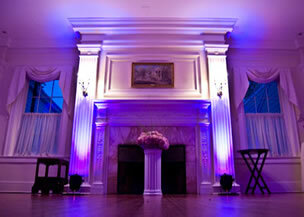 Reception adviceSome of the most popular wedding reception questions we get asked. After the ceremony it's time to celebrate and what better way to do it than a party! Gathering a group of people together in one place might sound simple, but it requires planning and budgeting to make sure you get the party you and your guests thoroughly enjoy. What is the most popular type of wedding reception at the moment? It is usual for the evening reception to last for about 5 hours (8-1) with an earlier finish recommended if the event is mid-week. This may seem a long time (about one third of the whole day) but it flies by and the Grand Finale comes around all too soon. The evening would normally start with the traditional Bride & Groom 1st dance, followed by parent/son/daughter dances, if required, and then a special song for the wedding (bridal) party. This is usually the last formality of the day so it's now time to relax and enjoy the party. The bride may wish to throw her bouquet at some stage although this particular tradition is less common, most choosing instead to either present the flowers to someone special or keep them as a memento. A mid-evening buffet is also very common, especially if extra guests have been invited for this part of the occasion. Having a disco as the main entertainment is still the most popular choice. The versatility of being able to play music to suit all tastes and ages in one of the key factors however it doesn't have to be just all music. Many DJs can also offer party games, a quiz, cabaret and karaoke to make the event memorable. Other options include a band/disco combination, ceilidh dancing, Irish dancers - even a comedian or magician. Could you name a few of the most popular type of music and songs you are asked to play? The most successful receptions are those that include a large variety of music genres, for example from Rock and Roll of the 1950s through to the latest RnB tracks. There is no set formula and the DJ will take into account the clients' requirements and use his/her experience to play the right music at the right time, taking the guests on a journey that is both memorable and unique to the occasion. The stereotypical image of a wedding DJ is someone who plays the most cheesy music ever produced. Fortunately this is not really the case. Todays professional wedding DJs will spend many hours planning each event, taking into consideration the clients wishes so that the music played reflects their personalities and makes the occasion unique for them. The Bride and Grooms first dance should also reflect their relationship. Romantic songs are still the most popular however it's not unusual to have a fun or upbeat tune to start the festivities. We use an online planner to help you get the best from the music choices. It will enable you to create your own request list and even allow your guests to add their choices too. At what stage in planning a wedding should the couple approach their chosen DJ or band? To ensure the best chance of your first choice being available my advice is to contact them as soon as your have your date/ venue arranged. The earlier you make your enquiries the bigger and better choice you have. This doesn't just apply to entertainment either - photographers, videographers, cars, suit hire can all be booked for popular dates up to 24 months ahead. Many wedding planner sheets recommend booking the entertainment at the 6 months before stage. Your choices will be limited if you leave it this late - unless your wedding is on a Tuesday in January! What would be the typical cost of a wedding DJ? You may receive quotes that vary immensely from £200 to over £1000 because there are many factors that influence price including demand for a particular DJ service, whether it is a hobby or profession, how much time/effort is invested in each event and how long you require the service for. You may want your DJ to cover the whole day, to provide music during your ceremony and wedding breakfast, as well as the evening, and this would also affect the price. Professional DJs will use top of the range equipment, carry back-up as well (just in case), spend many hours planning your event to ensure everything goes smoothly and have those other 'invisible' things such as Public Liability Insurance and Safety Certificates (now required by many venues). Price is an important factor and the temptation will be there to spend more on the cake or the decor than the entertainment especially when cheaper alternatives are available but keep in mind all the time and money you have committed to your event and the impact the DJ will have on how everything turns out. A successful wedding requires the combined efforts of a number of professional services working together. Your evening reception is just as important so choosing a Professional DJ who specialises in weddings is always a good investment. What advice would you give to any couple planning a wedding reception? Planning your wedding should be a fun and exciting time, not a chore. Having a plan of action will reduce the stress that normally occurs when you think something has been overlooked. There are many ways to achieve this but one of the best is to have a pocket size notebook that you can carry with you. Ideas can come at the strangest times so having the book to hand will ensure that these are added to your list straightaway. It saves having lots of pieces of paper that may go astray, left at work when you need them at home etc. It can also be daunting when you realise how much is involved in planning your wedding. Split this up into manageable chunks, allocate an area in your pocket book to each, delegate some of the jobs to friends/relatives who would be honoured to have a part in the organisation and suddenly what initially looks like one mammoth task is actually lots of smaller ones which are more enjoyable to accomplish. You can also print off the planner from my site to help. My final piece of advice is to research and find professional wedding service providers who can meet your specific requirements. Listen to their advice but also make sure that your own ideas and wishes are incorporated into the overall plan so that you achieve the wedding of your dreams. If you need us there earlier it he day to set up then this can be arranged. Simply contact us with the details and we'll prepare an all inclusive price.